Are you too a coffee dork? If you are, you are probably in a constant search for a newer, better and more functional brewer. Luckily for you, our Keurig K55 review might just help you find what you are looking for. This brewer, coming from a reliable manufacturer like Keurig is something a lot of people are searching to find for a very long time. So, if you are here, we suggest going through all the information about it – it might be your perfect suit. If you want to be a true fan of real coffee, the K55 is probably the way to go. It is an excellent brewer to have if you need one cup instead of brewing a whole pot and wasting it in the end, In addition to this, this brewer is surely an investment because although you don’t get a very big deal on it, you still end up using it a lot more and a lot longer than you would any other brewer that you can potentially buy. So, if you are looking for quality, you’ve come to the right place. If you are picky about your K-Cups, Keurig has good news for you. The K55 can be used with any other compatible cups if you prefer them. The best thing about it is that it is a single-serve efficient coffee maker which is simply a classic and a must-have. It includes 4 pods for K-cups and the package of the Keurig also includes a water filter handle and 2 water filters. The possibility of adding a water filter is simply amazing if you know the real difference. Namely, the cleaner your water is, the better your beverage will taste. With a water filter like this one, your Keurig coffee will have the richest taste and the most compelling aroma you can possibly imagine. The thing that you find in this Keurig as well as in most of the other models is the options that you rarely get. Namely, with the K55 you can brew multiple K-cup pod sizes. Specifically, you can choose between 6, 7 and 10 ounces of drinks. After all, these are the most popular K-cup brew sizes that you can need. If you are a lover of a strong cup of coffee, we suggest the 6-ounce one. With this K-cup brew size, you get a very strong coffee – perfect for starting your morning. In addition to this, we should also talk about numbers. The water reservoir is considerably large, especially if you note the size of the brewer overall. So, with the K55 you get a 48-ounce water reservoir. This basically means that you’ll brew more than 6 cups before having to refill the tank. Additionally, this surely simplifies the way your mornings start. One of the best things about it we simply have to mention in our Keurig K55 review is the descaling option. This is an essential part of cleaning your Keurig brewer. This procedure helps to eliminate calcium deposits or scale. They are harmful and can build up inside a coffee maker over time. So, this process improves the longevity of your brewer. We’ll have to end our Keurig K55 review by stating what you’ve been thinking. 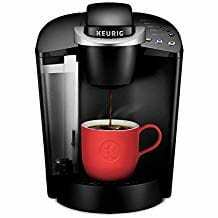 The Keurig K55 is the simplest, most compact yet most efficient brewer you can find at this price range. It has all the features a person would need, and it is the piece of technology that you must get. It is designed to save a lot of time and space without these advantages having a negative effect on the quality of the coffee. Once again, Keurig succeeded in making a compact yet functional brewer for all coffee lovers.